Whether you’re a PR pro or just starting to think about pitching yourself, there’s always more you can be doing to get attention for your brand and products. You don’t need an expensive PR firm to help you get visibility for your brand. There are a lot of things you can do yourself to get your name and product out there and in the press. Today on Rebel Boss Ladies episode 013 I’m joined by Katherine McDermott, creator of Slightly Savvy and the podcast Swipe Up, and she’s going to share all of her tips and tricks for DIY-ing your PR. 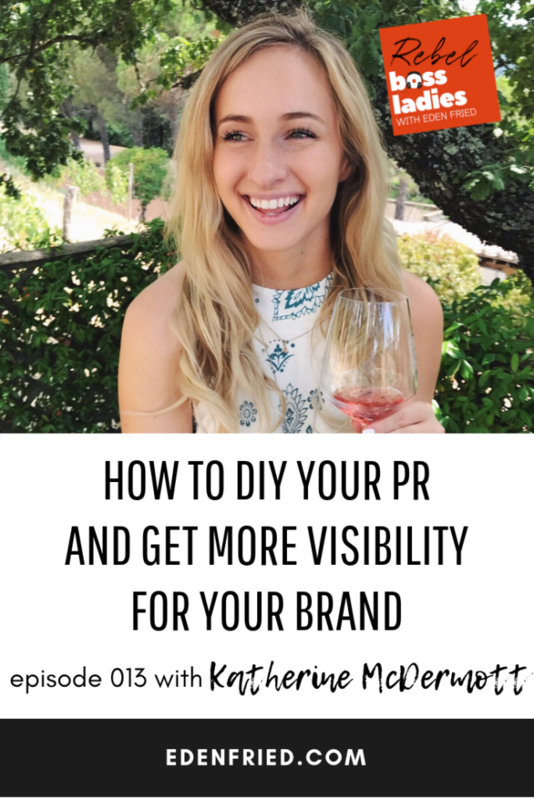 Katherine has been working professionally and online in PR for years and she’s got a TON of strategies and suggestions to help you get your name and digital product more visibility. Katherine says she was introduced to PR during college, when she got elected as the VP of PR for her sorority. It ended up being a life-changing year. “It ended up being a really crazy year at Florida State… We won a national championship, we had a school shooting, and we had a big football scandal so we constantly had ESPN knocking at sorority house doors for comments and things like that.” All of these events meant Katherine had a lot of exposure to the world of PR, and she pursue it after graduation. In July of this year, Katherine realized that she was tired of building other people’s brands for them, and it was time for her to build something for herself. She decided to build up her blog Slightly Savvy, which focuses on PR and working with brands and influencers, and turn it into her full-time job. After seeing the power of publicity and media mentions, she knew that her PR strategy could be the game changer to help her grow her business quickly. She focused on it early, and started getting a lot of attention after a few guest appearances and mentions. Katherine says that there’s a common misconception about when business owners should start focusing on PR. “I think a lot of people, especially entrepreneurs, look at PR and say “I need to wait 5 years before I do something like this.” She disagrees, and stresses that it’s never too early for business owners to start working on their PR. Katherine emphasizes that getting visibility for your brand is a lot simpler than most people think. She recommends that everyone, whether you’re a new business just starting out or a million dollar tech startup, think about 3 important categories to develop a PR strategy. First, think about the goal of your press. Do you want to drive more sales or get your name out there? Think carefully about what you want your outcome to be, and design your strategy around that. If you want to pitch your product, think about when you want your press to be released and plan accordingly. Don’t save your pitches for too late, or you may miss the key times for your launch. Finally, don’t forget to think about your dream media placements. Where is most valuable for you to be seen the few weeks before your launch? Katherine recommends that there are a lot of great places for online entrepreneurs to create press. Writeups in places like Forbes, the Fast Company, Inc., or other small- and medium- tiered publications, an interview in a podcast, and even making connections with other people in your niche can generate a lot of attention for your launch. “It’s as simple as making a list, finding some emails, finding contact info for them, reaching out and just pitching yourself.” DIY-ing your own press can be pretty easy, and you certainly don’t have to hire an expensive firm to bring attention to your launch. What is Press for Digital Product Sellers, and How Do You Incorporate It Into A PR Strategy? Katherine explains that the definition of press depends on who you are and what your business is. For digital product sellers, press can include media mentions, podcasts, and writeups in publications and blogs. She emphasizes that you should look at what your goals are, and how different press outlets can help you achieve your goals. Katherine generally defines press as “getting in front of another audience that’s not your own.” The important part about press is exposure. It doesn’t necessarily matter how you do it, as long as it’s promoting and exposing you to a larger group of people. Katherine says that the basis for getting any press is that you have to ask. Receiving a ton of nos can be overwhelming at first. Katherine recommends to not be too attached to your pitches, because nos are a regular part of this process. How Much Time Should You Spend on PR When You’re Launching a Digital Product? Press is also about momentum, Katherine adds. Just getting a few placements can lead to a lot of other opportunities organically. How Many Pitches Should You Send to Promote Your Digital Product? Katherine says that the number of pitches you send depends on how well you craft your pitch. You want to balance the time spent with the quality of the pitch, and not cross the line where “the quality of your pitch goes down where the number of yeses you’re going to get is going to go down as well0”. Organization is key in planning a PR strategy, and Katherine recommends a couple different tools and apps to keep your PR plan on track. First, how do you monitor your brand online? “In terms of true PR media monitoring, if you’re really looking for mentions of your brand there is a software called Mention.” This tool can help you keep track of where you or your brand is being mentioned, and help you find where you’re being talked about. There are also resources online to help you reach out to media sources and find contact information. “If you’re truly going that journalist, reporter route, Muck Rack is really good.” LinkedIn can also be a great way to find the emails of people you want to reach out to. To keep track of pitching and planning, there are a number of organizational tools. “I personally use Trello and Google Sheets to track literally everything I do,” says Katherine. A great way to stay organized is to hire some extra help. Finding an intern who can do time-consuming work, like searching online for contact information, can help you use your time more efficiently. Katherine likes to find interns to help with her list building, so she can focus her efforts on the more important things like crafting specific pitches and communicating with brands. It’s easy to find a college student or an intern on Upwork to help you organize your PR. When and How Should You Follow Up on Your Pitches? Katherine recommends that if you don’t hear a response from a pitch you’ve sent, you should wait a week to follow up. Your follow up should also depend on when and what you’ve pitched. Katherine’s biggest piece of advice for digital product sellers that want to take the step to start working on their PR? “100% I guarantee you people are going to say no to you and that is the best thing for you. You learn what pitch works, what pitch doesn’t.” Trying pitches can help you learn what type of pitches work, what time of year to pitch, and can help you keep an eye on trends and patterns. One really important thing to remember? You guarantee a no if you don't even send an email.